FRANKFURT, Germany, May 20, 2015 (ENS) – Endocrine disrupting chemicals, which can interfere with the actions of hormones in the body, are present in some plastic teethers for babies, new research reveals. 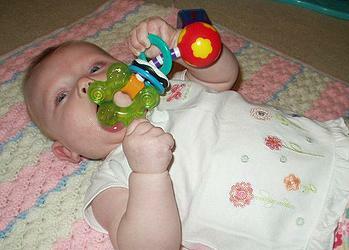 The chemicals can leach out of plastic teethers when they are chewed or sucked and enter the babies’ bodies through their saliva. Endocrine disruptors are chemicals that may interfere with the body’s endocrine system and produce adverse developmental, reproductive, neurological, and immune effects. Researchers at Goethe University at Frankfurt am Main found that of the 10 teethers they tested in the lab, two released endocrine disrupting chemicals. One product contained parabens, which are often used as preservatives in cosmetics, while the second contained six as yet unidentified endocrine disruptors. The findings were reported in the current issue of the “Journal of Applied Toxicology,” but the brands of the teethers containing the endocrine disrupters were not named. “The good news is that most of the teethers we analyzed did not contain any endocrine disrupting chemicals. However, the presence of parabens in one of the products is striking because these additives are normally not used in plastic toys,” said Dr. Martin Wagner of the Department of Aquatic Ecotoxicology at Goethe University, one of the study’s authors. The substances detected – methyl, ethyl and propyl parabens – can act like natural estrogen in the body and, in addition, inhibit the effects of androgens such as testosterone. The European Commission has recently banned propylparaben as a preservative in skin creams for babies because the chemical can enter the body through cracked skin. “Our study shows that plastic toys are a source of undesirable chemicals. Manufacturers, regulatory agencies and scientists should investigate the chemical exposure from plastic toys more thoroughly,” Wagner concludes. “Based on the current study, plastic teethers filled with a cooling gel can be expected to leach parabens. However, no clear conclusion regarding the function of parabens in teethers can be drawn. It appears plausible that the parabens were added intentionally to the gel filling as preservatives and they subsequently migrate to the plastic and leach from the product,” the authors state. The additives have only limited benefits for the quality of the product, but can present a potential health issue, Wagner warned. This is especially true for babies and infants, whose development is orchestrated by a delicately balanced hormonal control and who are more susceptible to chemicals exposures than adults. At the same dose the effects of endocrine disrupters in babies is higher than in adults due to their comparatively low body weight. To protect children from exposure to endocrine disrupting chemicals, the use of plastic softeners known as phthalates has been restricted in toys in the European Union since 2005. The authors say plastic materials may be an underestimated source of human exposure to endocrine disrupting chemicals.